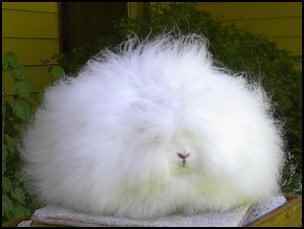 It’s no secret that the world’s softest garment fiber comes from a docile and adorable animal called the Angora Rabbit. Quiet and calm by nature, these animals have been used in fiber harvest for hundreds of years, and are thought to have originated in Turkey. Turkish fiber markets throughout history have also taken credit for the origination of the Angora Goat (who produce fiber known as Mohair, not Angora) and the forerunner to the Persian cat breed. Europeans have bred and mass-marketed Angora wool for centuries, the French were responsible for the popularization of it around 1790. North America would not see the import of these “exotic” rabbits until 1920. The North American Angora market today is still relatively considered a “cottage industry” with the bulk of fiber producers promoting and marketing their own product. Four distinct breeds of Angora rabbits exist today: the English, French, Giant, and Satin varieties all possessing their own unique breed characteristics. The “English” breed is considered to be the smallest, at 5 to 7.5 pounds with a compact body containing few guard hairs in proportion to the wool. The wool of this breed wraps tightly when spun, and is the most popular breed for show because of its amazingly prolific hair/fur on the face and ears. This specific breed of Angora may require daily grooming to keep its fiber free of debris and mats that can appear, causing the wool to lump up. These are sweet and gentle natured rabbits, who are excellent around children, but only with encouragement and parental supervision as to the daily care and maintenance of the hair. This breed is not recommended for anyone who does not have the time to spend in daily grooming. The “French” breed is a larger breed than the English, at 7.5-10.5 pounds. This rabbit has more guard hair ration to wool, which allows for more intense and varied colors in the fiber. Most of the color on the body of a rabbit is contained in the guard hair, rather than the under-wool that is normally light or white in color. This French Angora breed is considered the “easy-care” breed of Angoras, normally only requiring once-weekly grooming, and is the best choice for novices or youths. The “Satin” Angora weighs in at 6.5-9.5 pounds and has a shiny, satiny quality to its wool fiber. The hollow distinction to the fiber of these rabbits accounts for the intensity of coloration available in the breed, which does also appear in all white. Most spinners prefer this fiber for ease of spinning, and the dense coat is considered a pleasure to groom and harvest. The largest breed of Angora Rabbits is the “Giant” variety, weighing in at 10-20+ pounds! This breed is distinctive as it is only recognized at show in the “non-color”, white, and as it is the largest of all the Angoras, produces the most fiber from its superbly dense coat. This breed does not molt, or shed its hair naturally as do the other breeds, and so wool must be harvested by hand shearing. Angora wool can be harvested year round, and most fiber enthusiasts do this by holding the rabbit on their lap and either combing out the fiber, or (careful) scissor harvesting. The Angoras notoriously seem to enjoy this frequent attention, and the harvesting process causes them no stress or pain whatsoever. Angora wool harvesting is said to be a calming process for both the groomer and the “groomee”. A well-groomed animal will have very little debris in their fiber, and therefore the harvested wool is not required to be washed or carded (the process of removing debris from wool for even fiber texture/continuity prior to spinning). The raw wool is considered pleasing to the spinner because of its strong and yet soft texture, each of the breeds having their own distinct and unique fiber qualities, allowing for quick results in the spinning process. The wool is sometimes left in its natural color, but can be dyed. Angora wool has a superior quality in its ability to retain dye color permanently over all other types of wool fibers. Angora wool is normally mixed when knitted into clothing, with other soft fibers such as silk, cashmere, mohair, or sheep’s wool, at a usually no more than 30% ratio. Garments made of 100% Angora wool are undesirable as they would be too warm, and the texture too fine to provide density in knit stitches. Housing and care of Angora Rabbits to be raised in a commercial wool production facility, can range from large mesh cages/hutches off the ground, where debris and waste can fall through, keeping the wool clean; or large rabbit condos with mesh runs can be a good setup for clean and happy and leisurely movement of the rabbit. As with other breeds of rabbits, secure housing is imperative to protect the rabbit from predators & other rabbits, who may fight when quartered together. Most breeders of Angora Rabbits consider them to be companion animals (a.k.a. pets) and allow their Angoras the luxury of large cages with ample space to have freedom of movement, unlike some commercial meat rabbitries. With Angoras, cleanliness of living conditions is an important factor in maintaining fiber quality. Gestation of Angoras, as with other rabbits, is only 30 days, and their ability to reproduce themselves and many more in short order, is no different than with other breeds of rabbits. The buck, or stud male rabbit, should always be housed by himself, and only put in the cage with the doe (female) for breeding purposes. Male rabbits will fight with each other, and will often kill babies or young rabbits in the same cage. Angora Rabbits can live up to 10 years, and even longer. Angora Rabbits should be fed only commercial rabbit food, as this is specially formulated to meet all the rabbit’s nutritional requirements. Vegi greens are excellent treats but fruits and fibrous vegetables such as broccoli, cauliflower, or cabbage, can cause digestive upsets and diarrhea, which can be harmful for the animals as well as destructive to the wool. Rabbits DO love carrots, but these should also be given only as a treat in sparing amounts. The wool industry views Angora fiber as the “creme de la crème” of the fiber production market; and because Angora wool is always in high demand, and the number of those breeders producing wool for market in North America are relatively few, the price producers receive for their end product is often very good. 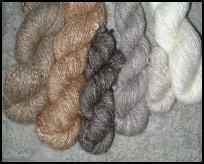 Angora wool can be marketed raw (unspun) or spun, in either dyed or natural colors. Benefits of raising Angora Rabbits: they are easy to keep and house, inexpensive to feed compared to other animals, easy and fast to breed to increase numbers of animals for wool production, the harvesting of wool brings much pleasure to the owner, raising Angoras takes no amount of land to produce them and Angoras are a no-kill livestock producer. Angoras are an excellent and diverse alternative to other types of livestock husbandry, and if one is so inclined to promote the raw or spun material, will certainly turn a profit, and bring much pleasure to the “Angora Farmer”. For some excellent information on Angora Rabbits visit The National Angora Rabbit Breeders’ Club (U.S.A.).